Eight months ago, forecasters at the Climate Prediction Center, a branch of the National Oceanic and Atmospheric Administration (NOAA), predicted El Niño would develop in the tropical Pacific during the spring or summer - and they were right. Yesterday NOAA climate experts predicted El Niño conditions will continue through the fall and winter and will strongly influence temperature and precipitation patterns throughout the country. "El Niño is the dominant factor affecting fall and winter weather," says Jim Laver, director of NOAA's Climate Prediction Center. The El Niño this year is mild compared to the 1997-98 event, and impacts on weather should be more subtle. NOAA's winter weather outlook. Courtesy of NOAA. Predictions for the fall are patchy and do not offer much solace at a time when more than half the country is experiencing droughts. "We don't see much relief," says Jack Kelly, director of NOAA's National Weather Service. Drier than normal conditions are expected in the Pacific Northwest and the Mid-Atlantic States. Southern Florida, the Southwest, and the western islands of Hawaii are expected to be warmer than normal. But for the rest of country, patterns of precipitation and temperature are up for grabs. The height of El Niño's impacts should be in the winter, which is part of the reason firm predictions cover more of the country in the winter than in the fall. 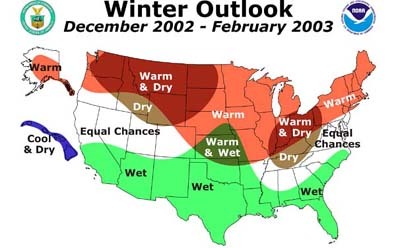 The winter is predicted to follow a "classic El Niño pattern," Laver says. That means more precipitation than normal throughout the southern part of the country, from southern California to the Carolinas. In contrast, Washington State, Northeast Oregon, Idaho, Montana, Wyoming, western parts of North Dakota, and northwest South Dakota are all expected to be drier. All of the northern states are predicted to be warmer than average. In the Northwest, much of the yearly precipitation falls during the winter, often as snow. The drier winter may therefore aggravate drought conditions from the summer. "The message for the Northwest is: the picture is not so rosy," Kelly says. 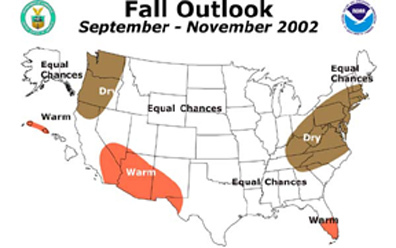 NOAA's fall weather outlook. Courtesy of NOAA. Along the east coast, El Niño is expected to double the frequency of storms, either rain or snow. This may accelerate beach erosion due to greater wave activity. This year's El Niño prediction came earlier than the prediction for the 97-98 event, and points to an increasing understanding of how El Niño works. Success rests, in part, on a system of buoys established in the tropical Pacific for the sole purpose of monitoring sea-surface temperatures. According to NOAA's definition, El Niño occurs when the sea surface in a section of the tropical Pacific (defined by 120 degrees west longitude to170 degrees west longitude and 5 degrees south latitude to 5 degrees north latitude) is 0.5 degrees Celsius, or more, warmer than the average (using 1971-2000 as the base period) for at least three months. The warmer seas set off a chain of events that affects weather throughout the world. But as the patchiness of the fall predictions suggests, there is still a lot of room for improving the monthly forecasts.